The empennage (/ˌɑːmpɪˈnɑːʒ/ or /ˈɛmpɪnɪdʒ/), also known as the tail or tail assembly, is a structure at the rear of an aircraft that provides stability during flight, in a way similar to the feathers on an arrow. The term derives from the French language word empenner which means "to feather an arrow". Most aircraft feature an empennage incorporating vertical and horizontal stabilising surfaces which stabilise the flight dynamics of yaw and pitch, as well as housing control surfaces. In spite of effective control surfaces, many early aircraft that lacked a stabilising empennage were virtually unflyable. Even so-called "tailless aircraft" usually have a tail fin (usually a vertical stabiliser). Heavier-than-air aircraft without any kind of empennage (such as the Northrop B-2) are rare. Structurally, the empennage consists of the entire tail assembly, including the tailfin, the tailplane and the part of the fuselage to which these are attached. On an airliner this would be all the flying and control surfaces behind the rear pressure bulkhead. The front (usually fixed) section of the tailplane is called the tailplane or horizontal stabiliser and is used to provide pitch stability. The rear section is called the elevator, and is usually hinged to the horizontal stabiliser. The elevator is a movable aerofoil that controls changes in pitch, the up-and-down motion of the aircraft's nose. Some aircraft employ an all-moving stabiliser and elevators in one unit, known as a stabilator or "full-flying stabiliser". The vertical tail structure (or fin) has a fixed front section called the vertical stabiliser, used to restrict side-to-side motion of the aircraft (yawing). The rear section of the vertical fin is the rudders, a movable aerofoil that is used to turn the aircraft's nose to one side or the other. When used in combination with the ailerons, the result is a banking turn, often referred to as a "coordinated turn". Some aircraft are fitted with a tail assembly that is hinged to pivot in two axes forward of the fin and stabiliser, in an arrangement referred to as a movable tail. The entire empennage is rotated vertically to actuate the horizontal stabiliser, and sideways to actuate the fin. The aircraft's cockpit voice recorder, flight data recorder and Emergency locator transmitter (ELT) are often located in the empennage, because the aft of the aircraft provides better protection for these in most aircraft crashes. In some aircraft trim devices are provided to eliminate the need for the pilot to maintain constant pressure on the elevator or rudder controls. a trim tab on the rear of the elevators or rudder which act to change the aerodynamic load on the surface. Usually controlled by a cockpit wheel or crank. an adjustable stabiliser into which the stabiliser may be hinged at its spar and adjustably jacked a few degrees in incidence either up or down. Usually controlled by a cockpit crank. a bungee trim system which uses a spring to provide an adjustable preload in the controls. Usually controlled by a cockpit lever. an anti-servo tab used to trim some elevators and stabilators as well as increased control force feel. Usually controlled by a cockpit wheel or crank. a servo tab used to move the main control surface, as well as act as a trim tab. Usually controlled by a cockpit wheel or crank. Multi-engined aircraft often have trim tabs on the rudder to reduce the pilot effort required to keep the aircraft straight in situations of asymmetrical thrust, such as single engine operations. Aircraft empennage designs may be classified broadly according to the fin and tailplane configurations. The overall shapes of individual tail surfaces (tailplane planforms, fin profiles) are similar to wing planforms. Location of tailplane - mounted high, mid or low on the fuselage, fin or tail booms. Cruciform tail - The horizontal stabilisers are placed midway up the vertical stabiliser, giving the appearance of a cross when viewed from the front. Cruciform tails are often used to keep the horizontal stabilisers out of the engine wake, while avoiding many of the disadvantages of a T-tail. Examples include the Hawker Sea Hawk and Douglas A-4 Skyhawk. T-tail - The horizontal stabiliser is mounted on top of the fin, creating a "T" shape when viewed from the front. T-tails keep the stabilisers out of the engine wake, and give better pitch control. T-tails have a good glide ratio, and are more efficient on low speed aircraft. However, the T-tail has several disadvantages. It is more likely to enter a deep stall, and is more difficult to recover from a spin. For this reason a small secondary stabiliser or tail-let may be fitted lower down where it will be in free air when the aircraft is stalled. A T-tail must be stronger, and therefore heavier than a conventional tail. T-tails also tend to have a larger radar cross section. Examples include the Gloster Javelin and McDonnell Douglas DC-9. Number of fins - usually one or two. Twin tail A twin tail, also called an H-tail, consists of two small vertical stabilisers on either side of the horizontal stabiliser. Examples include the Antonov An-225 Mriya, B-25 Mitchell, Avro Lancaster, and ERCO Ercoupe. Twin boom A twin boom has two fuselages or booms, with a vertical stabiliser on each, and a horizontal stabiliser between them. Examples include the P-38 Lightning, de Havilland Vampire, Sadler Vampire, and Edgley Optica. No fin - as on the McDonnell Douglas X-36. This configuration is sometimes incorrectly referred to as "tailless". Multiple fins - examples include the Lockheed Constellation (three), Bellanca 14-13 (three), and the Northrop Grumman E-2 Hawkeye (four). Ventral fin - underneath the fuselage. Often used in addition to a conventional fin as on the (North American X-15 and Dornier Do 335). An alternative to the fin-and-tailplane approach is provided by the V-tail and X-tail designs. Here, the tail surfaces are set at diagonal angles, with each surface contributing to both pitch and yaw. The control surfaces, sometimes called ruddervators, act differentially to provide yaw control (in place of the rudder) and act together to provide pitch control (in place of the elevator). V tail: A V-tail can be lighter than a conventional tail in some situations and produce less drag, as on the Fouga Magister trainer, Northrop Grumman RQ-4 Global Hawk RPV and X-37 spacecraft. A V-tail may also have a smaller radar signature. Other aircraft featuring a V-tail include the Beechcraft Model 35 Bonanza, and Davis DA-2. A slight modification to the V-tail can be found on the Waiex and Monnett Moni called a Y-tail. Inverted V tail:The unmanned Predator uses an inverted V-tail as do the Lazair and Mini-IMP. X tail: The Lockheed XFV and Convair XFY Pogo both featured "X" tails, which were reinforced and fitted with a wheel on each surface so that the craft could sit on its tail and take off and land vertically. An outboard tail is split in two, with each half mounted on a short boom just behind and outboard of each wing tip. It comprises outboard horizontal stabilizers (OHS) and may or may not include additional boom-mounted vertical stabilizers (fins). In this position, the tail surfaces interact constructively with the wingtip vortices and, with careful design, can significantly reduce drag to improve efficiency, without adding unduly to the structural loads on the wing. The configuration was first developed during World War II by Richard Vogt and George Haag at Blohm & Voss. The Skoda-Kauba SL6 tested the proposed control system in 1944 and, following several design proposals, an order was received for the Blohm & Voss P 215 just weeks before the war ended. The outboard tail reappeared on the Scaled Composites SpaceShipOne in 2003 and SpaceShipTwo in 2010. A tailless aircraft (often tail-less) traditionally has all its horizontal control surfaces on its main wing surface. 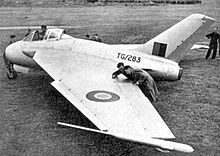 It has no horizontal stabiliser - either tailplane or canard foreplane (nor does it have a second wing in tandem arrangement). A 'tailless' type usually still has a vertical stabilising fin (vertical stabiliser) and control surface (rudder). However, NASA adopted the 'tailless' description for the novel X-36 research aircraft which has a canard foreplane but no vertical fin. The most successful tailless configuration has been the tailless delta, especially for combat aircraft. ^ Air Transport Association (10 November 2011). "ATA Airline Handbook Chapter 5: How Aircraft Fly". Archived from the original on 10 November 2011. Retrieved 5 March 2013. ^ "Empennage". Oxford Dictionaries Online. Oxford Dictionaries. Retrieved 5 March 2013. ^ a b Reichmann, Helmet: Flying Sailplanes, p. 26. Thompson Publications, 1980. ^ Ralph D. Kimberlin, Flight Testing of Fixed Wing Aircraft, AIAA 2003, p.380. ^ Kurt W. Muller; "Analysis of a Semi-Tailless Aircraft Design" (Master's thesis), Naval Postgraduate School, US, 2002. ^ Zdenek Titz and Jaroslav Zazvonil; "Kauba's Dwarfs", Flying Review International, Nov 1965, pp.169-172. ^ Pohlmann, Hermann. Chronik Eines Flugzeugwerkes 1932-1945. B&V - Blohm & Voss Hamburg - HFB Hamburger Flugzeugbau (in German). Motor Buch Verlag, 1979 ISBN 3-87943-624-X. ^ Benjamin Darrenougue; "Aircraft Configurations With Outboard Horizontal Stabilizers" (Final year project report), Queens University Belfast, 14 May 2004.